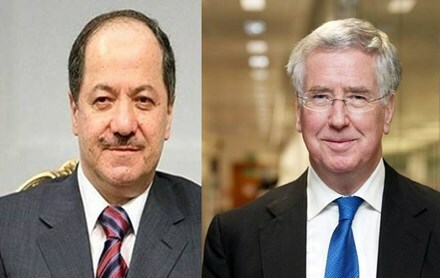 Salahadin, Kurdistan Region of Iraq, (Krp.org)- President Masoud Barzani received a letter from the United Kingdom Secretary of State for Defense, Mr. Michael Fallon regarding the Kurdistan Independence Referendum which was held on September 25, 2017. Secretary Fallon began the letter by thanking the President for his warm welcome during his visit to the Kurdistan Region on September 18. The Secretary also made reference to the importance of the Kurdistan Region’s Peshmerga forces in the collective effort to rid the region of the terrorists of the Islamic State. Furthermore, the Secretary encourages President Barzani to continue with the excellent coordination between the Peshmerga and Iraqi forces with the operations against the terrorists of the Islamic State.